Representative Teams: Ireland Wolves (Capt), Ireland U19s, Leinster Lightning, Munster Reds. Winning member of the 1st XI who won the Leinster Senior Cup v Leinster CC at Castle Avenue in 2016. Captained Ireland at the U19 World Cup in Bangladesh in 2016. Was ever present for the 1st XI during 2013 and has represented Leinster & Ireland at U15 & U17 level. A natural cricketer and genuine all rounder. Took a career best of 8/40 for the 1st XI versus Clontarf in Castle Avenue in 2012. Jack is the oldest of 3 Tector brothers all with great talent, inherited to them by their mother. Scored over 400 runs and took 24 wkts in 2011 playing mainly 3rds & 2nds. A former pupil of Sandford Park. Representative Teams: Ireland U19s, Munster Reds. Captained Ireland at the U19 World Cup in New Zealand 2018. 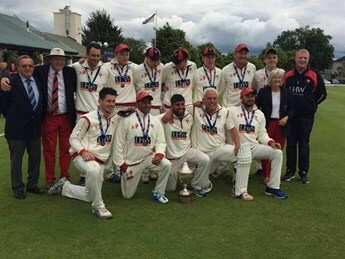 Played in the 1st XI who won the Leinster Senior Cup v Leinster CC at Castle Avenue in 2016. Member of the YM U15 team who won all 4 Trophies including the U15 All Ireland Cup v Bready CC. Also won the U13 All Ireland Cup. 'HT', the real HT, played U13 cricket in 2013 and senior cricket for 4thS/3rds & 2nd XI. Played 30 matches and excelled with both bat & ball, scoring 324 runs @24.92 & taking 35 wkts @ 21.49. Another of the Tector Clan who received his cricketing genes from his Mother. Representative Teams: Ireland, South Leinster, Ireland U23s, Irish Schools, MCC. Was a major influence as YM dominated Leinster cricket in the late 1980s and early 1990s. - youngest player (aged 20) to score a century in a Leinster Senior Cup Final (1984). - most M-O-M awards in Leinster Senior Cricket with 13. - only Irish player to win M-O-M awards in both the Benson & Hedges Cup and Nat West Trophy. - in 1984 became the 1st Irish-born player to score 1000 runs in a season. - 1st ball duck on his Irish debut: ct Joel 'Big Bird' Garner b Larry Gomes. - captained Ireland 35 times. - officiated in the 2003 & 2007 Rugby World Cups, Six Nations & Tri Nations. Former North County CC player who joined YM in 2016. Features both on the 1st & 2nd XI. 2013 saw JJ push his way into the 1st XI and for most of the season was the man with the gloves. Was a squad member of the Cup Winning team and is currently in the Irish U19 squad. JJ came into the 2nd team mid-way through the 2012 season and cemented his place with a great display behind the stumps against Clontarf in Castle Avenue. Is a genuine wicket-keeper, with good hands and can look forward to the 2013 season with great confidence. In his final year at St.Michael's College. Was the 1st Winner of the David Cooke Bowling Cup in 2013 and then regained it again in 2014. Padraic or 'Paddy' to his friends is a young lean fast bowling machine, who has played a major part in the three consecutive promotions and 2012 Middle Cup success for the 3rd XI. Represented Ireland & Leinster at U15/U17 level and is a past winner of the 'Young Leinster Fast Bowler of the Year'. Won the Barclay Walker Award in 2012 for most promising youth player in YM. Most unusual fact: Has an Australian father who doesn't play cricket!! Major Teams: Leinster Lightning, Ireland U19s, Nottinghamshire CCC 2nd XI, Somerset CCC 2nd XI, Loughborough MCC University. Made his First-class debut for Loughborough MCCU v Hampshire at Southampton, 2-4 April 2015. Played Club cricket for both Plumtree CC in the Nottinghamshire Premier League and Grade 1 & 2 for Fremantle District in Australia. Made his YM debut in the 2013 season taking 36. Parky returned to Ireland and YM in 2016 and this time for good as he is now a resident, married with a kid and here to stay. Has played 86 games for the 1st XI, currently taking 125 wkts @19.71 and closing in on 1000 runs. A big clean hitting batsman and athletic fielder. A product of the famous Parramatta CC in Sydney, Australia, he made a vital contribution to the 1st XI in 2009/10 as they won section B of the Leinster Senior League, taking 34 wkts to top the Leinster senior averages. 2017 Ireland U19 Squad member. Won the David Cooke Bowling Cup in 2016. Made his 1st XI debut in the 2015 season and was a member of the Leinster Senior Cup Winning 1st XI v Leinster CC at Castle Avenue in 2016. Took 48 wkts in 2014/2015, while recording his HS of 30*.Represented Leinster at Youth Level. Another U15 player who excelled on the victorious 3rd XI. Took 22 wkts in 2013 @18.73 and 3/36 on his 2nd XI debut v Cork in The Mardyke. Played in all 4 U15 Winning teams as YM swept the board clean including All Ireland Champions and U13 All Ireland Winners. Plays hockey for Avoca HC.